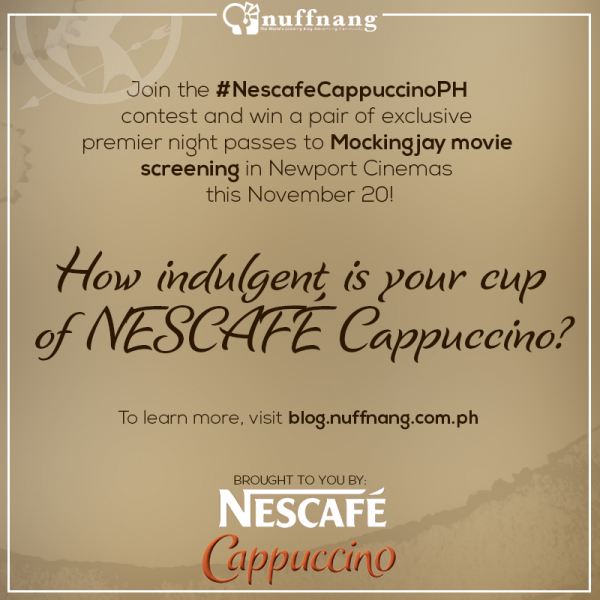 Luckyfinds: NESCAFÉ Cappuccino is the most indulgent coffee I’ve ever had! I love coffee. There’s nothing quite like a steaming cup of coffee to start a day right! The unmistakable aroma and delectable taste compels me to pry myself out of bed each morning. Who can resist the enticing aroma and taste of cappuccino? Nothing gets me on my toes better than a cup of NESCAFÉ Cappuccino. NESCAFÉ Cappuccino has all the creamy smoothness that makes a potent pick-me-up drink. The coffee foam and choco sprinkes in NESCAFÉ Cappuccino make it a more indulgent experience. I so love the combined flavors that the espresso, thick creamy milk froth dusted with chocolate sprinkles gives! Its choco sprinkles gives that indulgent feeling that no other brand has. Creamy and a little dreamy, NESCAFÉ Cappuccino is a coffee treat I can have at any time of day, daily. There is none other than NESCAFÉ Cappuccino indulgence that bring simple pleasure in my life! It helps make my the everyday a bearable especially when I have my hands full of work load! A cup of NESCAFÉ Cappuccino makes me feel less tired, and it increases my energy level. Coffee is one of the healthiest beverages being loaded with antioxidants nutrients that help improve one's health. This is one of the benefits coffee lovers like me delight in. I just love how the coffee foam and Choco sprinkles make the experience even more special since it gives that indulgent feeling. Do try out the indulgent experience that NESCAFÉ Cappuccino brings and delight in a chocolatey taste that lingers on the palette.